I find great solace in my little Woolly Room – there is fabric, and wool, and books, and buttons, and knits, and pictures … and there are also bags! If you are hoping to hear about Gucci, and Louis Vuitton and Michael Kors, then read no further. These are handmade, vintage, passed down, charity shop finds. Yes, there is the odd Orla Kiely or two, chosen because of my passion for pattern, but they don’t really count as designer in my eyes (sorry, Orla!). There are bags I’ve made for myself, and there are bags others have made for me. But let’s start with some of the very oldest. These are bags that have come to me from my grandmothers. I’ve never used the teeny weeny one at the top – the silk is perishing and it is very worn. It came from my maternal grandmother, but I think it is Victorian and may well have belonged to my great ( perhaps my great-great?) grandmother. A real treasure. 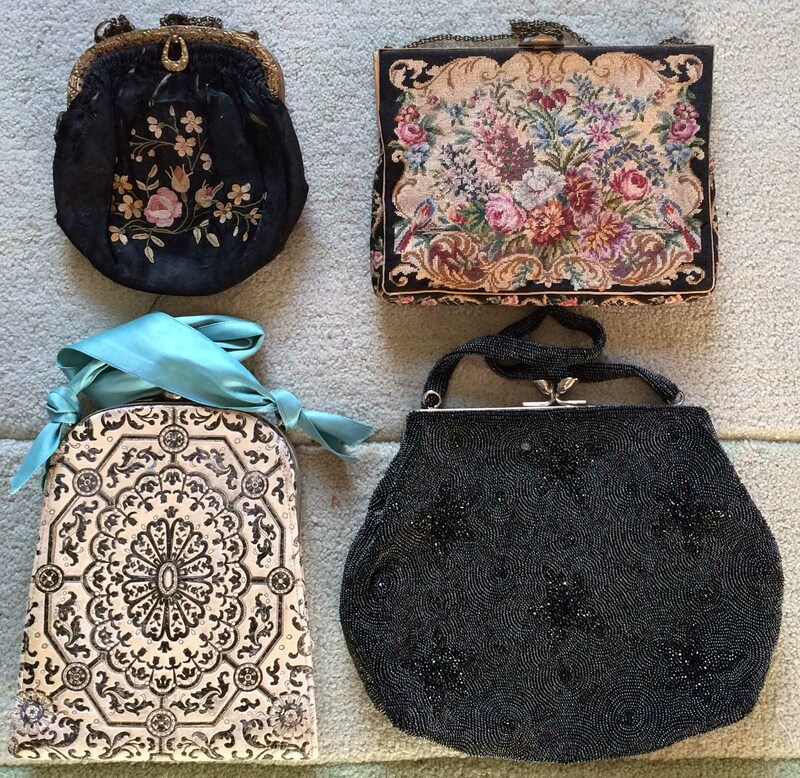 On the top right is a beautiful little petit point bag – and petit is the operative word here. The stitches are teeny tiny! I used it quite often when I was much younger – but now I am older and appreciate the workmanship more, I’m a bit reluctant to use it. As for the bag on the bottom left – it is one of my favourites and it comes out for special occasions like weddings. It’s stamped leather work, Florentine, very soft. The handle had perished so I replaced it with a ribbon which I can change to match my outfit. The bottom right beaded bag is Japanese, and what a labour of love! Teeny, tiny beads, subtle patterning. Just very, very occasionally I go to a very, very special evening event, and then this is my bag of choice. Exactly. Thank you, Mary Oliver. How do you always manage to say it so well. (I’ve altered her words slightly to fit the space on the bag) Other poets inspire me too. How evocative is this line is from John Donne’s poem of impossibilities! “Go and catch a falling star.” Lots of other little bags hang on the walls of my Woolly Room. This little group below features a charmingly hand-embroidered sewing bag, a colourful beaded bag from Monsoon below, a glam little evening bag cleverly made by my daughter from a gorgeous scrap of one of my grandmother’s dresses – and a Little My brown paper carrier bag! It takes all sorts! The next two little bags are both Japanese. My father worked in Tokyo for many years in my childhood, and my mother acquired a lot of beautiful Japanese fabrics while there. These don’t get much used, but they are much treasured. This piece of daughter Helen’s work glitters and glams it up. Featuring Alex from the Clockwork Orange, it’s a student piece of hers, made when she was a beginner seamstress. It’s just cool! Some thirty years or so ago (goodness!) I had a spell of enthusiastically painting patterns on fabrics. I wanted a commodious bag for a family trip to Paris, and this bag was just perfect. It brings back very happy memories. There are lots of green bags, of course (my favourite colour). That’s an Orla Kiely bag on the far left; next is an amazing mock-croc I found in a charity shop; then, there’s my embroidered leaf bag; next is a bag made in the Phillippines of recycled packaging (so ingenious); and on the right, a ditsy little grass effect bag – much faded, alas, but still convincingly grassy. Just – very occasionally – I will buy an expensive bag. I found this bag on Ebay, whilst searching for felted bags, and – it was irresistible. What makes it so very fascinating is that the pattern is completely created by the embroidery – and what an extraordinary range of embroidery stitches there are! Was it a sampler? So often I have looked at it and wondered who CF was, and when she (he?) lived. I’m guessing it was done in the 1920s-30s – what do you think? There are working bags of another sort – my sewing and knitting bags. This is my much-travelled Solace bag which accompanies me with my knitting when I go away. It was a gift from Rebecca of Needle & Spindle (so had quite a journey in the first place to get here from Melbourne), and it does indeed give me great solace. Portable solace, you might say. And there are still new bags coming! This is another needlework/knitting bag, and another generous gift. I just love the lemon-slice print – thank you so much, Issy. Not just bags of fun – bags of happiness, inspiration, memories, treasures, generosity … and love. Very enjoyable post! I loved seeing your collection, and I got some ideas for some vintage fabrics in my own collection of family heirlooms. Thank you! Thank you! I am so glad you enjoyed the post – and even more so to think that you may have found inspiration here. Delightful post and I feel privileged to have stayed so recently in your lovely woolly room, admiring your assortment of beautiful designed bags on every spare space of wall. Dear Gilly – I’m so glad to think you’ve enjoyed staying in my Woolly Room with all its mess and muddle! Yes, the bag I made for my father is very special to me – I never use it, but it just sits there as a happy memory. kathy I loved your colourful assortment of bags and I feel very privileged to have stayed so recently in your lovely woolly room and from the vantage point of my bed I could admire them, covering every square inch of wall! I particularly loved the bag you made for your father, a real labour of love and with the quotations he so liked, it must have been very special and meaningful to him! I must say, after seeing your collection I feel quite bereft!! at least of bags 🙂 What a marvelous collections and the 3 wickedly knitting ‘ladies’ well…………Lachesis is also a Homeopathic remedy from the venom of the Bushmaster snake in S. America. So much food for thought looking at your treasures, thank you! I had to get my very large Greek dictionary out to check my sources here, Susan! I’d remembered Lachesis as meaning Forgetfulness, so I was thinking that this snake venom might make one forgetful, but I’m wrong. Lachesis comes from the Greek word for lottery, so I guess that Fate is the arbiter of the lottery of life. It would seem that the Bushmaster snake venom is extremely poisonous – so I guess if you got bit, you’d drawn the very shortest of straws, and death is imminent. The Homeopathic remedy must be the tiniest of tiny quantities for it to be safe – what is it used to treat? All so interesting! http://www.webhomeopath.com/homeopathy/homeopathic-remedies/homeopathy-remedy-Lachesis_mutus.html This may not make much sense to you until you realize how remedies are made and tested…only on Humans! It was invented by Samuel Hahnemann in Germany in the 1800’s. I have a homeopathic physician, have worked in a Homeopathic Pharmaceutical company, studied in Switzerland and the Netherlands. This article is way too long: http://www.britishhomeopathic.org/how-does-homeopathy-work/ but I couldn’t find anything else at the moment. I also use the remedies on my dogs/cats. my sister has used it on the horses. A good practitioner is the key to anything, always! In reading your answer to Rebecca’s post I was surprised at your reluctance to invite us into your ‘Woolly’ Room . I find you very interesting and well written, so, Thank you ! Thank you for your warm words, Susan – just me being silly about privacy. I was brought up by a tiresomely “private” mother. And a big big thank you for sending me this info about Lachesis – what a lot it is used to treat! Amazing stuff. I was pleased to see you like Mary Oliver. There is a new book coming out called The Hidden Life of Trees by a German forest ranger. Looking foreward to it. Mary Oliver is just a delight….. I try to read a bit of her poetry daily. She says everything I ever want to say so beautifully. I don’t know this tree book but it sounds very interesting. I enjoyed seeing your bag collection kd….thank you for sharing. You have given me the urge to get out my sewing machine. I have some grey wool felt waiting to become a bag, I just needed some inspiration and your embroidered words and lines from poems are beautiful. Oh how inspiring! I just carry one tan leather bag everywhere, although I do own a couple of fun bags made in Peru and Cambodia, but they just seem too flamboyant to carry in public. But I love the idea of incorporating quotes you like, and patterns, and stitches… I may have to become a little braver about showing some personality with a handbag! Well, I do have a very plain black bag which I use a lot of the time ….. that’s why I hang the bags on the walls of my Woolly Room. They’d never be seen if they weren’t there! – one doesn’t always want to make too much of a statement of personality with one’s dress. It depends very much how you’re feeling – sometimes I feel more like making a statement than others 🙂 I think you could do something fantastic with your quilt and patchwork ideas for a bag. Oh my what gorgeous bags. I particularly love the ones inspired by poetry. I shall have to look up Mary Oliver. So glad you like the bags. I cannot recommend Mary Oliver too highly – she says all the normal things we all feel in the most special way. What a post full of joy! I love that not only are your bags beautiful but they bring together so much about your life, interests and family. And thank you for reminding me about Mary Oliver – I have only read the ‘wild and precious life’ poem and will seek out more. Thank you so much for your kind words. It is true – the bags are sort of embedded in my life. As for Mary Oliver – she’s just wonderful! Thank you, Alina – yes, I think each bag has a story and that is why they are so special for me. Inspirational! From now on I shall no longer automatically associate handbags with footballer’s wives and other slaves to fashion and brands, but rather something personal, unique and hand crafted. I have a well made functional man-bag, but one that lacks any personal quality whatsoever: that could also be said of my day-to-day clothing. That’s got to change! Well, I’m delighted to hear you no longer associate handbags with footballers’ wives! A successful blogpost, I think 🙂 So glad to hear you enjoyed reading it – and I look forward to hearing about the new you! Glory! I feel very honoured to be represented in such a wondrous collection of bags. It is kind of you to include it amongst these marvels and I am glad it is a companion to you in your travels. When I read this post, I felt my mind opening out with so many possibilities for how history, language and poetry might be incorporated into craft works. The layers of knowledge, insight and reflection that are so thoughtfully and creatively enmeshed in these works are rather awe inspiring. As I was reading this post, I kept thinking what an interesting person you are and what an intriguing mind you have cultivated. At the same time, I had this overwhelming sad feeling that whilst we are so fortunate that technology allows us to share the ideas and experiences of folks from far away, it is just not the same as a shared walk or a chat over tea where we can ask you a hundred questions about the bags you have made, why and how they came to be, the ideas discarded along the way and the other ones generated from the making that yearn to be explored. A wonderful post Katherine. Ah! What a gracious reply! Thank you for so gently reminding me of the transformative connectivity of the internet when I was just feeling sad. I too remember feeling very isolated in my craftwork. Taking the risk to share projects, ideas, hopes and failures in community, has enlarged my perspective and sense of fellowship, and I think my bravery. You are so right to centre this aspect of the internet. It is liberating. These are fortunate days. Your bags so deserved a public outing! What a richness and delight, and they remind me of staying with you surrounded by them all. Next Next post: Spring is in the air – sort of!